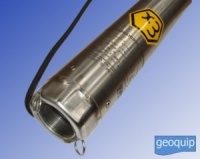 ATEX Multistage centrifugal electric 4" submersible borehole pumps all stainless steel construction. Suitable for pumped liquids to +30°C and depths of 120m in water without solid particles and in non-aggressive clean water. Also available in all AISI 316 version and version for permanent immersion in hydrocarbons polluted water. Fully customised and bespoke models available on request.